Editor’s note: As part of our Most Influential Post of 2015 contest, we are re-publishing the articles that made you think, made you act, or maybe even made your day. This article was the most-viewed post on NextBillion for July 2015. To see the full list of the most popular posts in 2015 and to vote for your favorite, click here, or simply scroll down to cast a ballot. After an early start to beat the traffic, I take a seat next to Helen Lightcrown in her small shop, which sells hair products in the Oshodi district of Lagos. A generator is humming away outside, powering a ceiling light and a small fan which provides some relief from the heat and humidity. I’m in Lagos to meet women entrepreneurs who are training to become agents at Firstmonie – a mobile banking platform offered by Nigeria’s FirstBank. As agents, they will offer banking services to their local communities, where limited access to bank branches is one of several factors preventing a large population of Nigerians from accessing formal financial services. Thanks to funding from Visa, the Cherie Blair Foundation for Women has partnered with FirstBank and the Youth for Technology Foundation (YTF) to train 2,500 women entrepreneurs across 10 Nigerian states as Firstmonie agents. FirstBank provides technical training on the banking products, which is supplemented with broader training on business and financial literacy skills, delivered by YTF. Our research has shown that enrolling more women into agent networks can extend commercial benefits to service providers, as higher levels of customer service delivered by women agents increase public trust in bank products and brands. 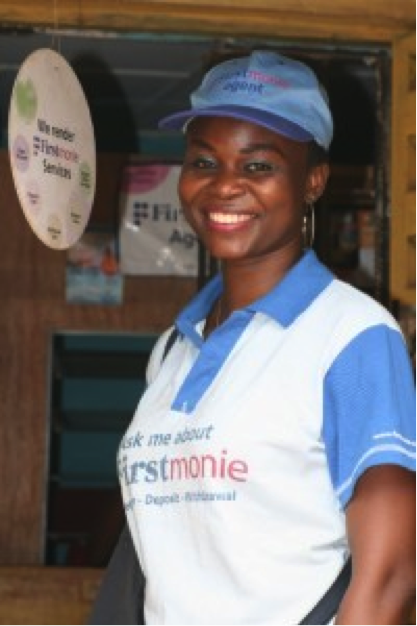 As a Firstmonie agent, Helen (pictured above) provides banking services to customers from her existing shop through the use of a mobile device – essentially acting as a mini, one-person bank branch. Customers can register accounts with her, make deposits and pay bills, all without having to travel long distances to formal bank branches. Helen’s new business is prominently marketed by the FirstBank promotional banners festooning the exterior of her shop. But Helen is taking the publicity one step further: In the induction training delivered by the bank and YTF, she learned that she can’t just rely on passersby for trade. So every day Helen heads out to the local market to promote both her hair care products and her Firstmonie business. She says that the training has also made her feel more confident with managing her money and keeping better business records. Tope was first introduced to the Firstmonie opportunity through her local church group, and attended the training to find out more. She said, “I realised that as there are no bank branches around here, it was an opportunity to help those women needing to pay school fees. Helen and Tope are just two of the women who are benefitting from our project in Nigeria. They are proof that, with a little bit of training and encouragement, women are able to overcome some of the barriers they face in generating a sustainable income for themselves and their families. Furthermore, as mobile banking agents, they will extend vital financial services to underserved Nigerian communities, playing a key role in fostering greater financial inclusion in the country. Editor’s note: This post was originally published on the Cherie Blair Foundation for Women. It is cross-posted with permission. Matthew Strickland is Mobile Technology Programme Manager at the Cherie Blair Foundation for Women.